The RAEviewer - A blog about luxury and high-end cosmetics: My Epic Japanese Beauty Haul featuring ADDICTION, THREE, SUQQU, Ladurée and more! My Epic Japanese Beauty Haul featuring ADDICTION, THREE, SUQQU, Ladurée and more! It has been a couple months since my trip to Tokyo, but I can't stop missing it. Instead, I will have to settle for dreaming of when I can visit again and share all the incredible beauty purchases I made! I saved up for months because my wish list was a mile long. Now, makeup shopping in Japanese department stores is a time-consuming adventure so prepare yourself! Swatching seemed to be highly discouraged, and there is strict 'no returns' policy. The sales associates will open up every box to confirm that you are taking home the color(s) you requested. More details after the jump! Overall, I found shopping in Tokyo to be very pleasant because of the excellent customer service. I first purchased the Cle de Peau Brightening Powder Foundation (Asia exclusive) at a duty-free shop, either in Singapore or Narita. Most of the shades were out of stock, but a couple lighter shades were available, so I brought O20 home. 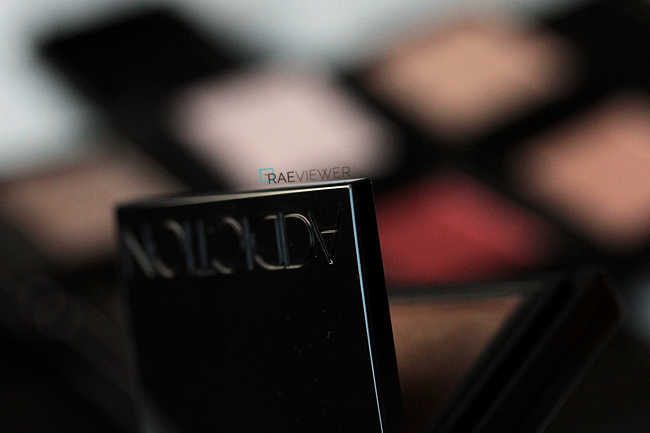 Unfortunately, it was too dark and too red, so I made sure to stop the by Cle de Peau counter to grab a lighter shade. I still haven't tried it on, but I think 00 will be a perfect match! 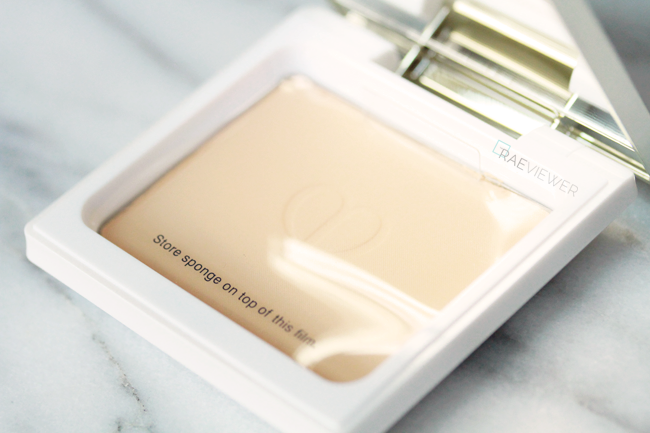 I just adore the pearly white and platinum compact. 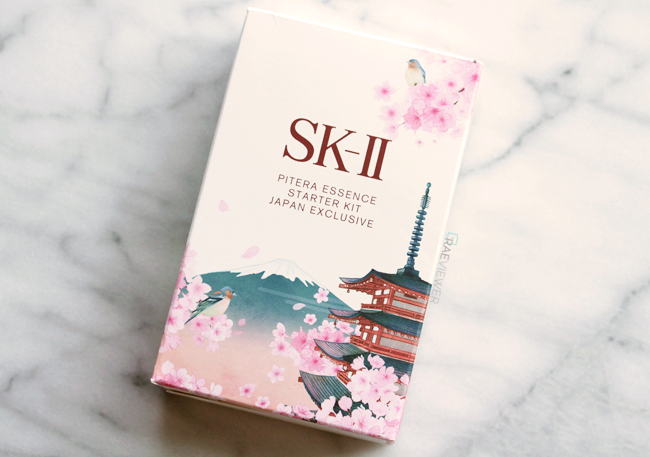 Then we have the gorgeous SK-II Pitera Essence Starter Kit, a Japanese Exclusive that is perfect for traveling. 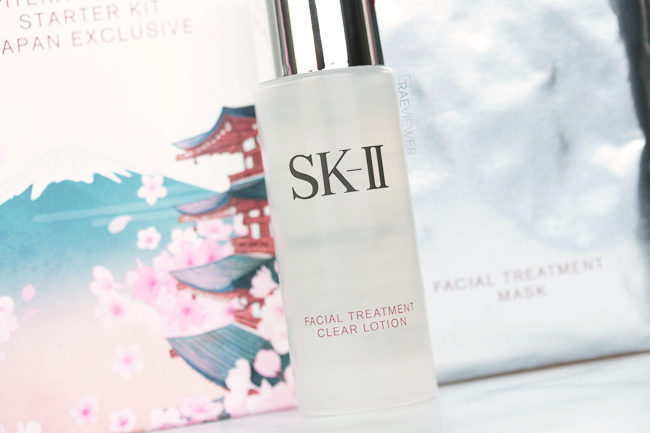 The deluxe sample size 30ml bottle of the Clear Lotion should last a week with morning and evening use, and the 75ml Facial Treatment Essence is too adorable! The bottle is made of glass just like the standard full size 150ml bottle, but 75ml is approximately 2.5 oz so you can pack it into your carry-on luggage! Plus you get a Facial Treatment Mask, which is one of my in-flight essentials. I hear women complain about dull dehydrated plane skin all the time, but ever since I stopped feeling so self-conscious and started using masks during my flights, my skin suffers significantly less! Trust me, I wouldn't do it if the results were not impressive. And no, I've never scared a flight attendant. Let's move on to some of the best purchases I made in Japan! THREE skin care has blown me away. I generally don't use sample packets, but because most of these products are not easily accessible, I tried as many as I could. Good thing I did because I wouldn't have discovered or purchased THREE's cleansing foam otherwise. 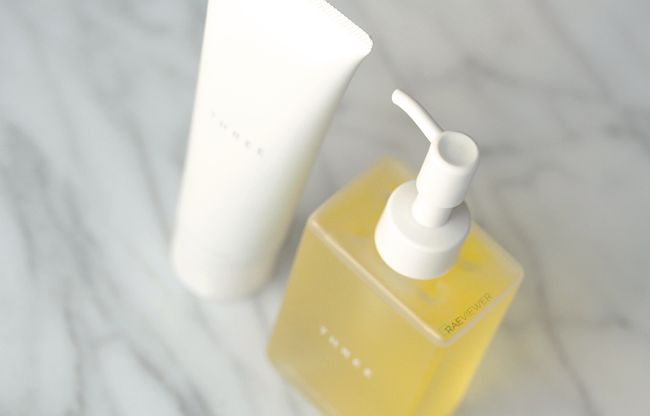 I sought out the cleansing oil since so many Asian beauty editors like my friend May swear by it, and the dry formula and bright lemon fragrance definitely lived up to the hype. I even bought a back-up! The cleansing foam, however, turned out to be equally impressive. It is ultra rich and highly concentrated, so I use this one sparingly. 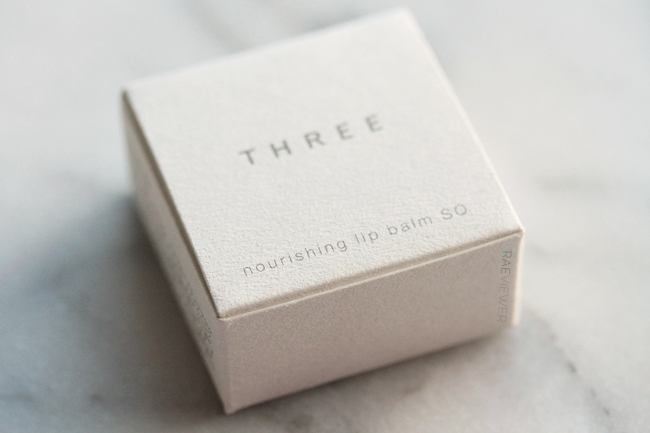 Since I loved the cleansers so much, I also decided to splurge on their lip balm. It reminds me of jelly candy, and it melts so easily into the lips. I also purchased THREE makeup after watching one of Japan's most celebrated makeup artists use a few products on my friend Nayoung. I own a few of THREE's Flash pencil eyeliners, so I decided to branch out and try the eyeshadows, a new eyeliner pencil, lip gloss, brow pencil, and brow powder. 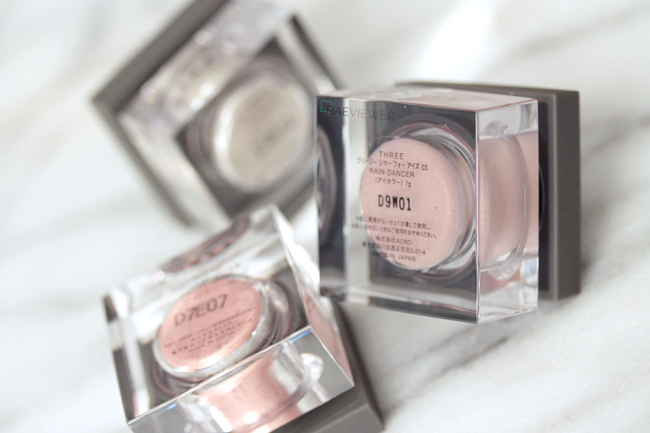 The cream base and loose powder eyeshadows are truly refined and sophisticated, but more importantly, they are easy to wear! You don't even need brushes because a clean fingertip works just as well. Totally foolproof! I especially love makeup shopping in Japan because the sheer and glittery highlighter shades I'm so fond of are literally everywhere. Les Merveilleuses de Ladurée is one of the hottest Japanese brands at the moment, and the prices reflect it. The compacts and cases are quite expensive, more than I would have liked to pay for plastic. Still, curiosity got the best of me and I walked away with a couple bags. My initial impression is that the pressed blushes are the best "bang for your buck" buy, and I wish I had brought home a few more. I love that the colors are intensely pigmented and the brushes in the compacts are surprisingly soft and actually useful. I skipped the delicate rose petal blush — despite how beautiful it was — but I couldn't resist the loose face powder. Since I do not wear blush daily, I figured the powder would be a smarter commitment. I also chose a couple lipsticks, two face brushes, the brush holder (because they might as well have a matching home), and the eyebrow palette. Please do not use and republish my photos without prior consent. Thank you! SUQQU makes some of my favorite base makeup, so of course I stopped by the counter to learn more. All the Japanese makeup girls are very professional and well trained, but the SUQQU reps go the extra mile and don white gloves when handling your goodies! I ended up with a cream compact foundation, two powder foundations, medium eye brush, face scrub, brow palette, and my new Holy Grail — the eyebrow pencil. It's so amazing that I went out of my way to buy a back-up of the refill while I was in London. Some of SUQQU eyeshadows and lipsticks are phenomenal, but I was saving room in the color budget for ADDICTION. I spent hours looking at the shades on ADDICTION's website in preparation for my trip to Tokyo. Seeing the beautiful selection in person, however, was a totally different experience. 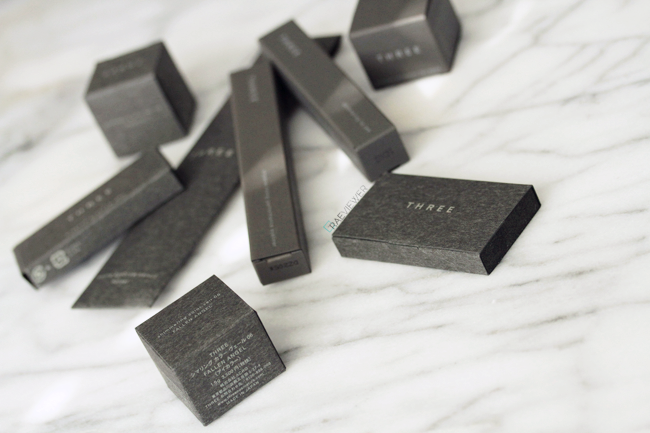 From the font styling to the sleek black packaging, every little detail is perfect. I limited myself to twos except the eyeshadows. I ended up with 7 eyeshadow singles and 6-pan case, the powder foundation and case, the liquid eyeliner, the eyeshadow primer, the SPF 50 sunscreen, 2 pencil eyeliners, 2 lipsticks, and 2 lip glosses. I would have bought more when I discovered that the entire lineup was sold in duty-free, but I had no more room in my luggage (or my budget). Just kidding; I had just enough wiggle room for one of the duty-free exclusive eyeshadow compacts which came with a satin brown and sparkling pink. There were 3 different variations available. If I'm ever back at Narita, though, I will be sprinting to the ADDICTION and THREE bays! And many of you may already know this, but Japanese drugstore makeup is far superior to what you find in American pharmacies like CVS. Even high end brands like Maquillage are available in the makeup aisles! Pretty impressive. I stocked up on Dollywink, Miche Bloomin' and DUP lashes, DUP lash glue, Rohto eye drops and eye cleansers, heated eye masks, sunscreen, and other random goodies like salon pas. I also discovered an affordable cleanser, Shiseido's Perfect Whip, thanks to a few Korean bloggers I met. It's about $5 USD and outperforms all $20 cleansing foams. If you're ever in Japan, buy half a dozen and give them away as gifts (which is what I did). My Japanese beauty blogger friends Asahi and Risa bought me these cool cotton pads and face masks. I'm super excited to try them! As I have mentioned before, I'm still in the process of photographing and testing all the products. In due time, I will review everything here on the blog. I will also dedicate a post to where I shopped, since that was highly requested. If there is anything else you're interested in, please comment below! I am so excited with all your japanese purchases ! I am going to Kyoto next month so i am really looking forward for all your reviews ! So excited to see the cherry blossom☺️And shopping and by the way can you tell which facial would you recommend at the Koh Gen Do spa or would they choose it for me when they do a consultation? Thank you do much looking forward to your response! I am so jealous of your asia exclusive purchases! thank you for sharing! What a fabulous post! Thanks. Oh, how I wish many of these brands were readily available in the US without having to pay an arm and a leg for shipping from Japan! If these brands were available in the US, they'd make a killing. Back in the day, we had a very Euro-centric bias towards cosmetics. In particular, if it was from France or Italy, it was considered to be the very best. That's no longer true thanks to the internet and international travel. Beauty is global and there is a huge untapped market in the US for Japanese luxury brands. When I went to Tokyo last summer, I took an extra case for all the goodies I knew I'd be bringing back for myself and friends. I had so much fun shopping in Tokyo. Everyone was so gracious and accommodating. I spent more than I had originally planned, but having access to all those wonderful Asian brnads and to the Asian exclusives by the European brands had me feeling like it was the proverbial Christmas in July. I got a chuckle out of the visual of you and a plane load of chic women stretched out in flight with beauty masks on your faces. :-). It's certainly becoming a common sight especially on transpacific or transatlantic flights, but I haven't quite gotten up the nerve yet. I do use Tatcha eye patches in flight and cover them up with my sleep mask while I nap, but the full on face mask I reserve for when I get to the hotel. Perhaps I'll be braver next time. Great haul! My siblings and I are actually going to Japan (our first time!) in a couple months! We're staying for just a week, though. Do you have any recommendations for must-see activities, i.e., places to visit, shop and eat? Thanks! It really depends on what you're looking for! I highly recommend the Asakusa district, where you can visit the famous temple and shop/eat at the nearby vendors! That was a fun beauty trip !! I would love to try the three products too ! Especially the lip balm . Les Merveilleuses de Ladurée has such a cute packaging. 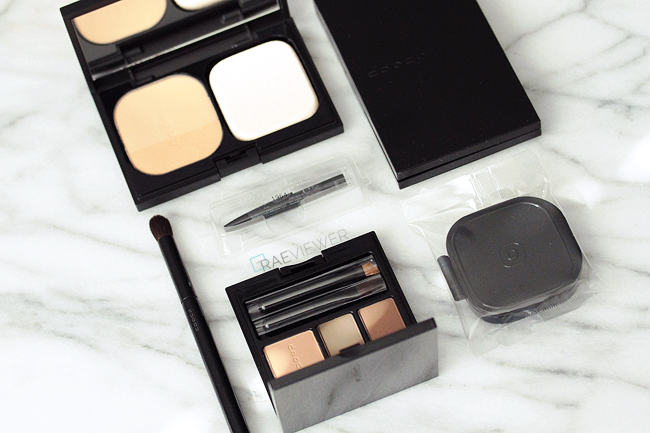 It has become very popular here in US too among the "makeup addicts" circles. Even though it is not easily available in store, some items from Les Merveilleuses de Ladurée will be in my collection very soon. Could you post swatches of the blushes that you got? Yes, my friend is in Taiwan and picked up a couple more for me! Once she brings them back, I will swatch all four. Oooh! Lovely items :) It sounds like you had an amazing time. I have a question - is Suqqu and Three well-stocked at Narita airport? Or should I be safe and just buy the items when I'm in Japan? 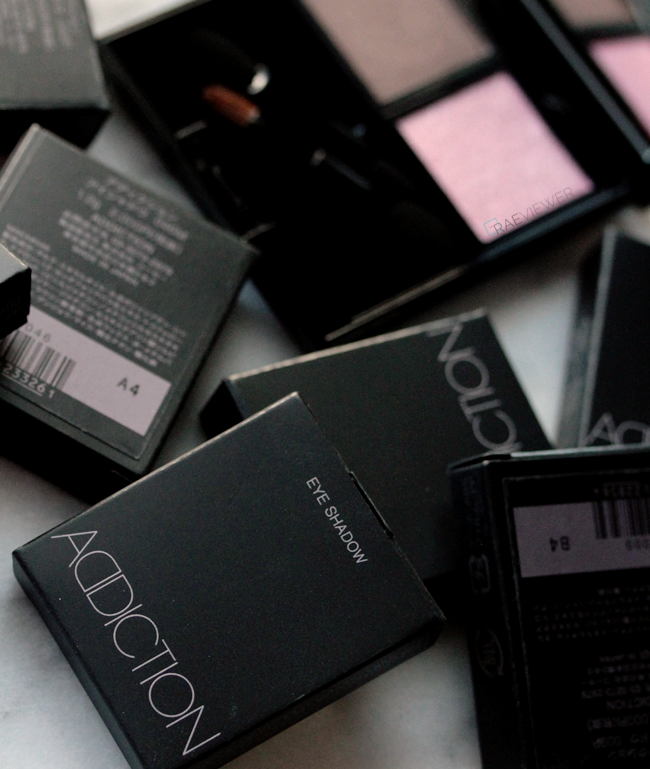 Will you pretty please swatch and review the Addiction eye shadows soon? Hi! 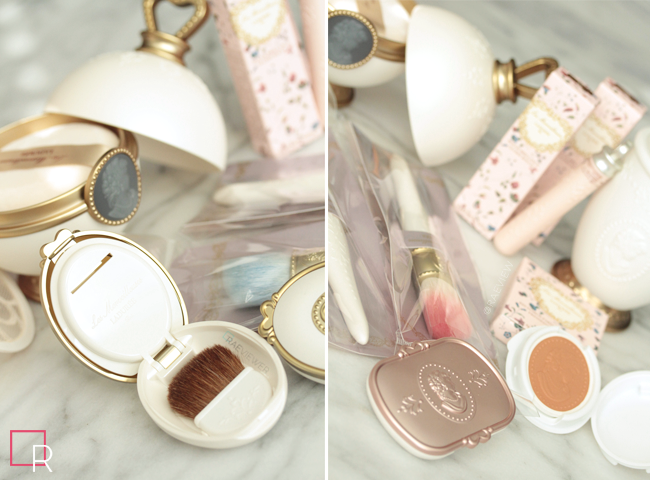 Hows the laduree cosmetics? Planning on reviwing it anytime soon? My dad is going to Tokyo and I've given him a long list of stuff. It's all higher end like Suqqu, SK-II etc. i keep ordering lashes on line from China and Japan and failing!! I like house of lashes noir fairy and Red cherry 43. So dramatic lashes. Would you recommend dollywink?